This first issue of two of "Convergence: Superman" has been a pleasant surprise to read. I didn't pay much attention to what led to Convergence so I had no expectations for it. I felt like I dropped into a story that already started, but that it was very easy to follow because of the pacing and the way the main points of the plot were casually revealed through the dialogue. I like the direction of the story so far and the representation of the characters. I especially like the way Lee Weeks depicts Superman... both Supermen, in fact. So from what I gather in this issue is that several different cities were being held captive under domes, but the domes have finally lifted and each city has to use it's strongest defenders to fight for it's survival because only one city can be allowed to live. This is all being executed by a villain named Telos, who is only a voice being broadcast. Gotham City and Flash Point universe Gotham City face off against each other. The fight is made trickier as the Flash Point Superman confronts Lois Lane of pre-Flash Point who no longer exists in his universe. 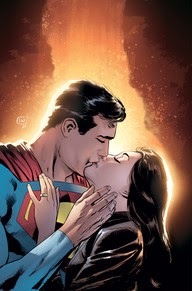 The emotional strain on Flash Point Superman is huge as he is faced with a version of the woman he loves. He seems like one of the most crucial factors as to which city's defenders will end victorious since he seems like a very unstable person. Meanwhile pre-Flash Point Superman has his hands full fighting Green Lantern, Cyborg, Captain Thunder, and Batman of the Flash Point universe. And I should mention that Lois Lane is pregnant and looks like she'll give birth any minute. The paradoxes the characters face having to confront alternate versions of themselves is cool. Not only is it simply a physical fight amongst themselves that they face but those internal struggles as to the decisions that they've made that led to this. The art is my favorite part of this issue, too. I really like the inking and the dynamic character shots. The lines are never that long but the variations in them make the work feel fluid. I wonder if Jimmy Olsen was shot down. It'll be interesting to see how this wraps up in the next issue.